Our hand-carved and sustainably sourced golden bamboo chasen are Pesticide-Free and never chemical treated. 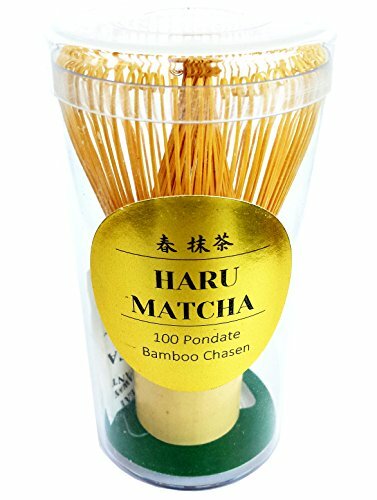 With 100 prongs, this chasen is perfect for whisking up a frothy bowl of matcha everytime. Each chasen is unique and no two are ever alike. We are extremely proud to bring you a high quality hand-made chasen. Soak the bamboo tines in warm water to soften bristles to prevent it from easy breakage. Gently whisk back and forth for about one minute. It's now ready to be used! To avoid damaging any of the bamboo prongs, try not to scratch or pressing down too hard while whisking. The prongs should barely touch the bottom of the bowl. Use cold water to rinse the bristles. Pat dry with paper towel or shake off excess moisture. Place your whisk on a whisk holder or face up and allow to air-dry. HIGHEST QUALITY- Beautifully handcarved from a single bamboo by skilled craftsmen. ORIGIN: Bamboo grown from Kansai region - Non Chemical / Pesticide treated bamboo. USAGE: Whisk up lump-free bowl of matcha everytime. A must-have for matcha lovers. QUICK NOTE: After a few uses, the tines/bristles will straighten out, and the core will bloom. Don't panic! This is normal and to be expected. Also, do not store it in its original plastic container. Because bamboo is a natural fiber, it be susceptible to slight molding if not properly stored. No need for concern, just let it soak in boiling water and clean. If you have any questions about this product by Haru Matcha, contact us by completing and submitting the form below. If you are looking for a specif part number, please include it with your message.